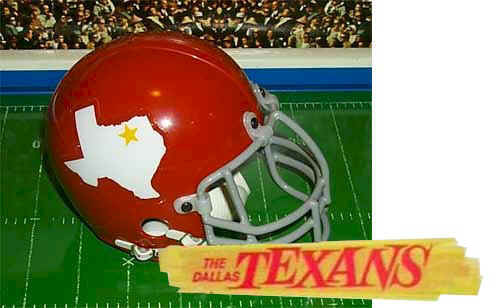 The Dallas Texans/Kansas City Chiefs franchise was the flagship team of the American Football League. Originated as the Dallas Texans by AFL founder Lamar Hunt, the franchise had the most playoff appearances as an AFL team, six (tied with Oakland), the most American Football League Championships (3), and the most Super Bowl appearances, playing in the first Super Bowl, and in the last to be played between LEAGUE champions. The Texans won the classic 1962 double-overtime AFL championship game against the Houston Oilers, 20 - 17; the longest, and one of the best Professional Football championship games ever played. 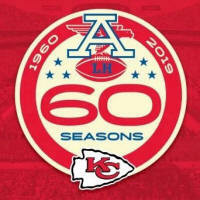 The Chiefs dropped the first Super Bowl to the Packers, then pulverized the Vikings 23 - 7 in the final "true" AFL-NFL World Championship game after the AFL's last season in 1969. 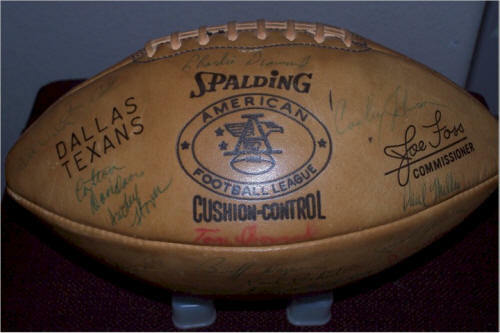 A 1960 Dallas Texans autographed ball. Player signatures include Cotton Davidson, Smokey Stover, Curley Johnson, Paul Miller, Clem Daniels, Sherrill Headrick and others. Click on the photo to see three views of the ball. According to Cotton, these were promotional balls that were thrown into the stands as souvenirs at Texans games. The ball seems smoother and lighter in color than a standard AFL game ball, so it may have been specially made for autographs. See the similar ball at the Broncos page. T; 76 Buffalo Napier, DT; 79 Charley Diamond, T; Fifth Row: 80 Max Boydston, E; 85 Ed Bernet, E; 86 Paul Miller, DE; 87 Mel Branch, DE; 88 Chris Burford, E.
Photo courtesy of AFL and Texans fan Jim Fulton. Note that Clemon Daniels, who went on to star as an Oakland Raiders running back, is listed as a defensive halfback, while Johnny Robinson, the best defensive back NOT in the 'pro football' Hall of Fame (and better than most that ARE in it), was listed as an offensive back. Defensive Tackle Paul Rochester won an AFL Championship in 1962 with the Texans, and then went on to win another, as well as a World Championship, with the 1968 New York Jets.. In this 1961 Dallas Texans team photo are the following: names courtesy of Chris Burford. Click on an underlined name for more on that person. 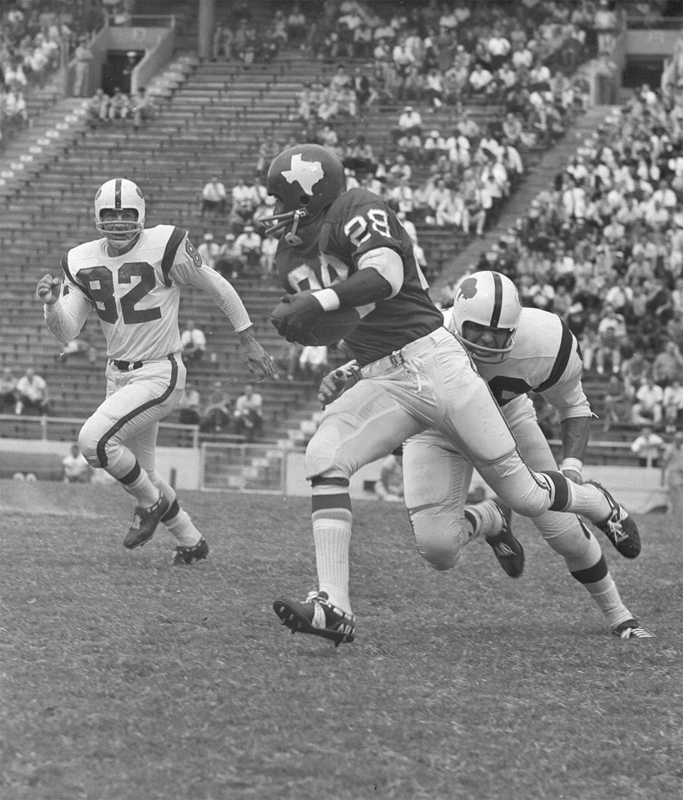 The Texans' Abner Haynes escapes Houston Oiler outside linebacker Bucky Wegener in the 1962 double-overtime American Football League Championship Game. Michigan State University's Fred Arbanas was the perfect tight end not only because of his 6-foot-3 frame and 240 pounds of chiseled muscle. 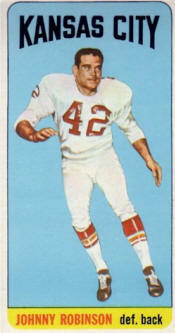 Drafted by the Chiefs in 1962, Arbanas was an American Football League All-Star in 1962, ' 63, '64, '65, and '67. Because of his heart and perseverance, he was the driving force behind one of the greatest teams in the history of the American Football League. He was the AFL's prototype tight end. His 198 receptions and 3,101 receiving yards are still the Chiefs records for the position. 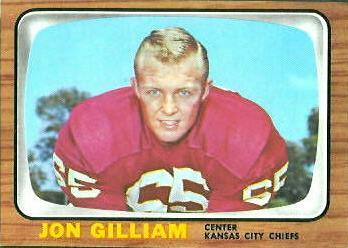 In 1964 he lost the vision in one eye, but he rebounded to give the Chiefs six more solid years. 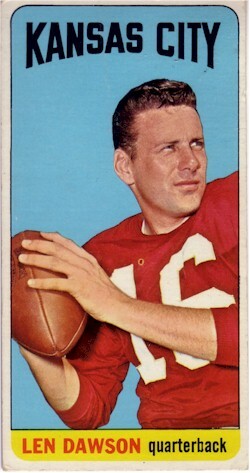 Arbanas starred for two Chiefs Super Bowl teams and used the playing field to write a legacy for the AFL. 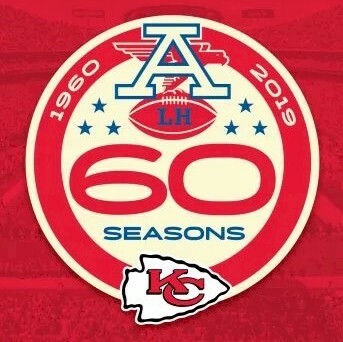 "I remember when the Chiefs played the Chicago Bears the summer after the loss to Green Bay in the first Super Bowl," team owner Lamar Hunt said. "We won the pre-season game 66-24, but there was a lot at stake in that game. I heard Fred say that was his most memorable game, and I feel the same way." His hard-nosed play and consummate skill earned a spot on the All-Time All-AFL Team. Bobby Bell was named an All-American at the University of Minnesota, where he won the 1962 Outland Trophy as the nation's outstanding interior lineman. 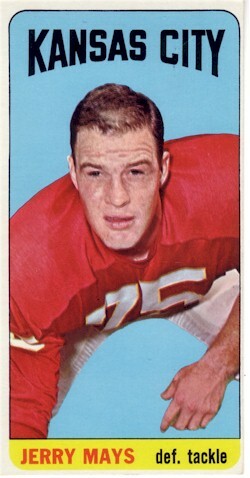 He was drafted by the Chiefs in 1963 and was an AFL All-Star for six straight years, 1964 through 1969. He was on two AFL Championship teams and a World Championship team. He was named to the All-Time All-AFL Team in 1970. 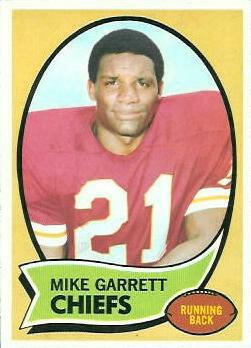 He was inducted into the Chiefs Hall of Fame in 1980, and the Pro Football Hall of Fame in 1983. The Chiefs retired his uniform number 78. In 1999, he was ranked number 66 on The Sporting News' list of the 100 Greatest Football Players. Bell was noted for his one-of-a-kind athleticism, and was called the most physically gifted linebacker and one of the finest open-field tacklers in professional football history, because his speed at such a size made him ideal at his position. He scored 9 tds in his career: 6 on interceptions (26 in his career), 2 more on fumble recoveries, and one on an onside kickoff return. 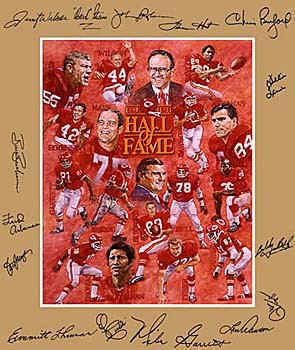 Hall of Fame Coach Hank Stram said that Bobby Bell "could play all 22 positions on the field, and play them well." In 1962, as a Dallas Texans rookie from Alabama, Tommy Brooker made all of his 33 extra-point attempts, and 12 field goals. His biggest score, however, came as a 24-yard field goal to end the second sudden-death overtme period in the 1962 American Football League Championship game. That game, between the Texans and the two-time defending AFL champion Houston Oilers, was the longest AFL game ever played. Brooker's field goal with 2:06 left in the second overtime gave the franchise its first of three AFL Championships. 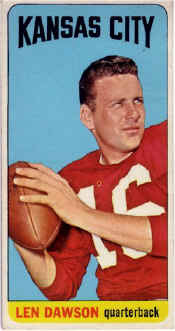 Athough Brooker played only five years, he was second only to George Blanda in consecutive successful kicks for points after touchdowns, with 149. He made every PAT he attempted in those five years, never missing. Brooker also holds a share of the AFL record for consecutive field goals attempted and made in a game, eight. Eddie Robinson, Buck Buchanan's head coach at Grambling, where he had been an NAIA All-American in 1962, called him "the finest lineman I have seen." 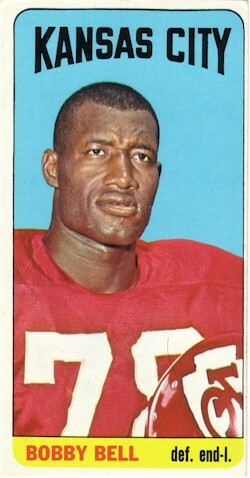 Buchanan was the first black number-one draft choice in Professional Football history. Buchanan had the physical size plus the athletic instincts to be exceptionally successful at his job of foiling opposing offenses. He was particularly effective at intimidating the passer and in one season alone (1967), he batted down 16 passes at or behind the line of scrimmage. In the 1963 NFL draft, Buck Buchanan was selected 265th overall in the 19th round by the NFL New York Giants. 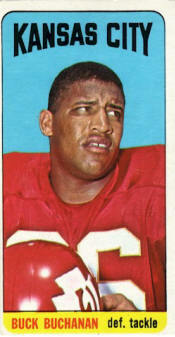 Whether the NFL thought so little of his talent, whether his low draft status reflected the NFL's poor opinion of small black colleges, or or whether that league simply conceded Buchanan to the more aggressive and diverse American Football League, the 6'7" 287 pound Buchanan was the first player selected overall in the 1963 AFL Draft by the Chiefs. He was clocked at 4.9 in the 40-yard dash and 10.2 in the 100-yard dash at Grambling, and with that speed he could range from sideline to sideline to make tackles. Buchanan was extremely durable. He played in 182 career games that included a string of 166 straight. After playing defensive end as a rookie, he settled down to his permanent job as the Chiefs' defensive right tackle. He was named to his first AFL All-Star Game after his second season and played in six AFL All-Star games. 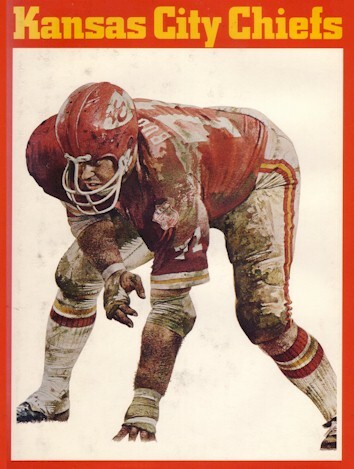 He teamed with Curley Culp, Aaron Brown and Jerry Mays to form a dominant front four for the Chiefs, culminating in their victory over the over-rated Vikings in the Fourth AFL-NFL World Championship game, when they allowed only 67 yards rushing in 19 carries and 172 net passing yards. 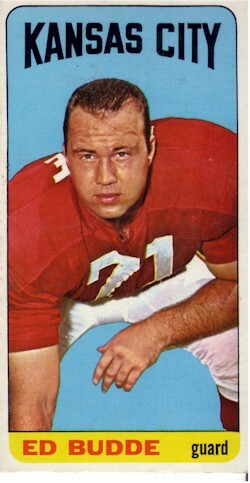 Buchanan in particular dominated the opposing center, Mick Tingelhoff, supposedly unbeatable in the other league. 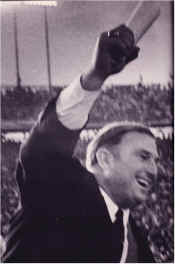 He was inducted into the Alabama Sports Hall of Fame in 1987 and the Pro Football Hall of Fame in 1990. In 1999, he was ranked number 67 on The Sporting News list of the 100 Greatest Football Players, right behind his former Chiefs teammate Bobby Bell. 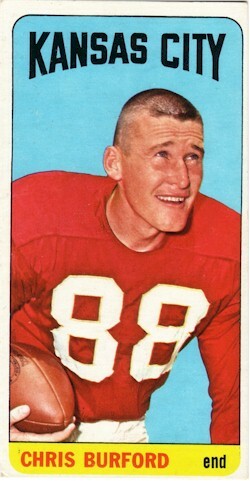 The Chiefs retired his uniform number 86. Buchanan is a member of the second team All-Time All-AFL Team. In 1963, Ed Budde, a standout in college at Michigan State, was the No. 1 draft pick of the Dallas Texans. 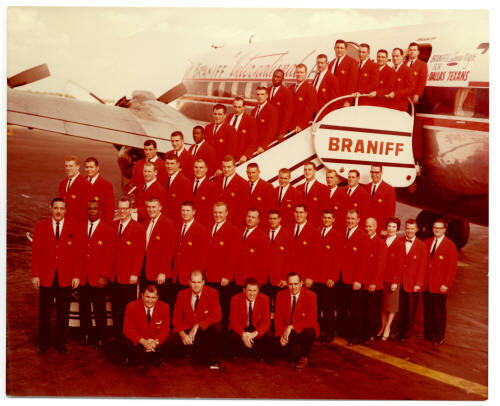 The team became the Kansas City Chiefs before the 1963 season began. An offensive guard, Budde went on to play for the Chiefs longer (14 years) than any other player, with the exception of Hall of Fame punter Jerrell Wilson. Budde was huge: 6-foot-5 and 260 pounds; and his explosive blocks could spring a running back loose or keep defenders away from the Chiefs signal-caller. He was selected to the AFL All-Star team in 1963, 66, 67, 68 and 1969, and he played in six AFL All-Star games. Budde was the first offensive lineman to be selected by the Associated Press as an Offensive Player of the Week. 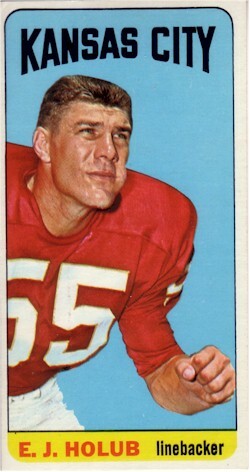 As the heart of the Chiefs offensive line, Budde's overpowering presence helped the Chiefs to win two American Football League Championships (1966 and 1969) and a World Championship in Super Bowl IV. Budde is a member of the All-Time All-AFL Team. 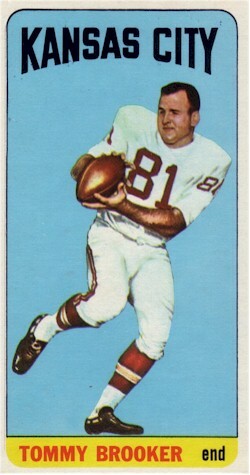 A member of the STANFORD Athletic Hall of Fame and the College Football Hall of Fame, Chris Burford was the first drafted player to sign with the Dallas Texans, who he chose over the Cleveland Browns. 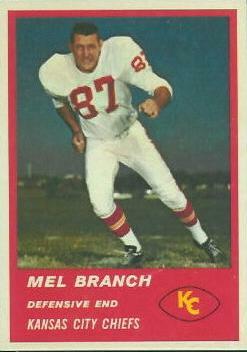 He was a master of sideline receptions for the Texans and the Chiefs. What he lacked in great speed or physical presence, he made up for by running perfectly choreographed pass routes that outsmarted most American Football League defensive backs. 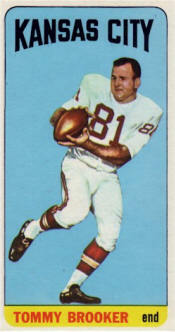 An AFL All-Star in 1961, he followed that performance with 12 receptions for touchdowns in 1962, leading the league. By the end of his career he was the Chiefs all-time reception leader (391) with 5,505 yards and 55 touchdowns. 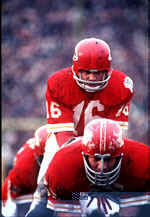 Teaming with Hall of Famer Len Dawson, Burford was a clutch receiver when the game was on the line and the ball had to be moved forward for a needed first down or for field-goal position. For most of his AFL career, Burford was in the top ten in receiving catches, yards, and touchdowns. 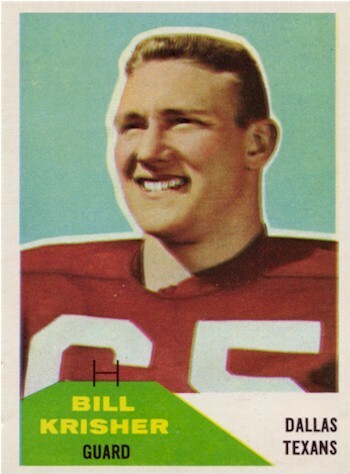 On October 12, 1962, he had a career game aginst the Boston Patriots: 10 receptions for 171 yards and a touchdown. Burford is a 1974 inductee of the Chiefs' Hall of Fame. Another so-called NFL reject who showed that the old league�s talent evaluators blundered when they decided certain players weren�t �good enough� to play in the NFL, was Purdues Len Dawson. 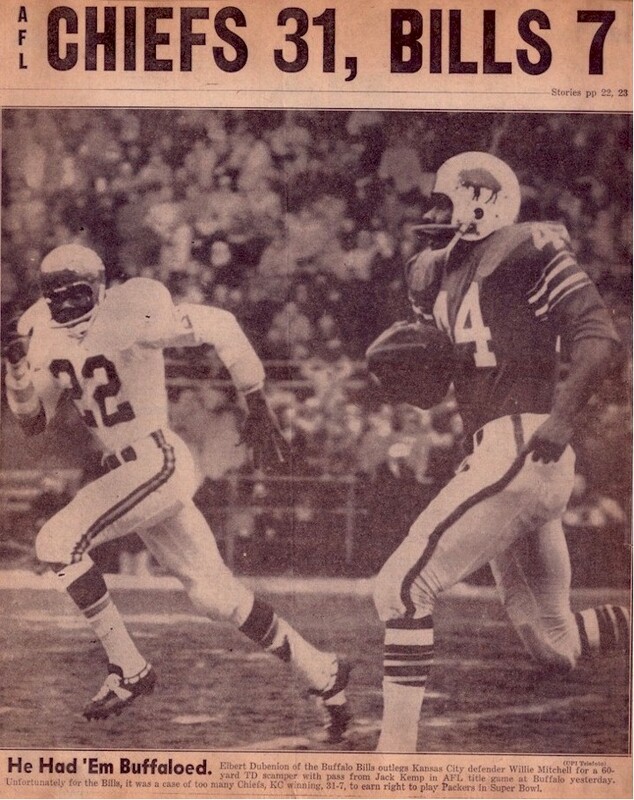 In his first year in the American Football League, Dawson led his Dallas Texans to a double-overtime victory over the two-time defending American Football League Champion Houston Oilers. The game was a classic, and Dawson ran a ball-control offense for a 17-14 win. Dawson had a 28-yard touchdown pass to Hall of Fame halfback Abner Haynes. In that first season, 1962, Dawson had led the league in touchdowns and yards per attempt. He was the Sporting News selection as the AFL MVP for 1962. A pinpoint passer with four AFL passing titles, he went on to be selected an AFL All-Star six times, and holds the American Football Leagues number one career passer rating. He quarterbacked his team to three American Football League championships. Dawson was the MVP in the Fourth AFL-NFL World Championship game, the last game ever played by an American Football League team. He led the league out in glory, defeating the over-rated Vikings, who, like the Colts of the previous year, had been touted as �the best team in Professional Football history�. NOT!! Dave Grayson played offensive and defensive halfback at the University of Oregon. He was drafted by the Dallas Texans in 1961 and played four years with the Texans/Chiefs before joining the Oakland Raiders in 1965. Grayson held the AFL record for longest interception return for a td, 99 yds against the New York Titans in 1961. He had an interception off George Blanda in the Texans' classic 1962 double-overtime championship game victory over the defending AFL Champion Houston Oilers. Grayson was All-AFL in Dallas/Kansas City in 1962, 1963 and 1964, and in Oakland in 1965 and 1967, when he again played on an AFL Championship team. Grayson is the all-time AFL leader in interceptions with 47, for a 20-yard return average and 5 tds, and he averaged 25.4 yards on 110 kickoff returns. He is a member of the American Football League All-Time Team. In 1956 Abner Haynes attended North Texas State University (now the University of North Texas), where he helped make the school one of the first in Texas to integrate its football program. 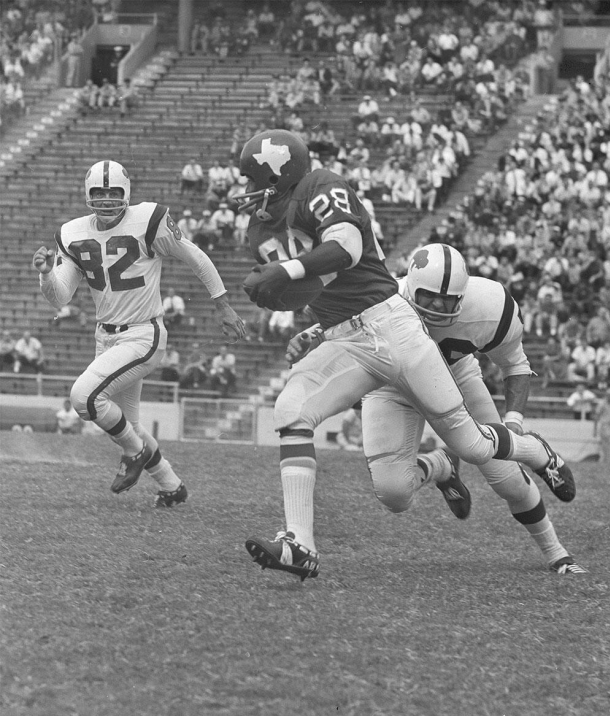 In 1960, Haynes chose to play for the Dallas Texans and led the American Football League in rushing attempts, yards, and TDs in the leagues first year. 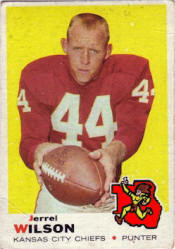 Haynes helped launch the AFL in 1960, when he was the fledgling league's first Most Valuable Player, and its first Rookie of the Year. He captured the AFL's first rushing crown with 875 yards, and also led the Texans in receiving, punt returns, and kickoff returns. 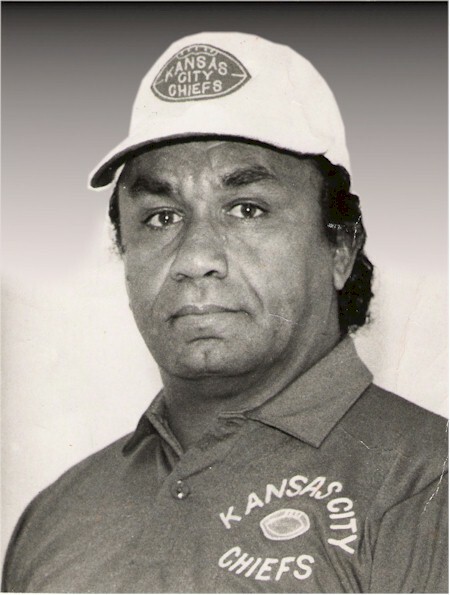 Haynes spent three years in Dallas and two with the Kansas City Chiefs. Haynes still owns 11 franchise records, including most points in a game (30), most touchdowns in a season (19), most touchdowns in a game (5), most career 100-yard rushing games (12), most career rushing touchdowns (39) and most career combined yards (8,442). Over his career he was regularly among the American Football League's top ten rushers, ranking third all-time, and the all-time leader in touchdowns, with 46. He was Hall of Fame head coach Hank Stram's most versatile and dangerous weapon from 1960-62, amassing 43 touchdowns and 4,472 yards on rushes and receptions. In 1962, he helped the Texans win the American Football League championship in the classic double-overtime victory over the defending champion Houston Oilers, scoring touchdowns on a 28-yard pass reception from quarterback Len Dawson, and on a 2-yard run. "He was a franchise player before they talked about franchise players," praised Stram. "He did it all - rushing, receiving, kickoff returns, punt returns. He gave us the dimension we needed to be a good team in Dallas." The 6-foot-1, 200-pound Haynes, who had great speed and dazzling moves in the open field, set AFL records with 5 touchdowns in a game and 19 touchdowns in a season in 1961, and with 46 career rushing touchdowns. He also played for the Denver Broncos, the Miami Dolphins, and the New York Jets. During his 8 professional seasons, Haynes carried the ball 1,036 times for 4,630 yards, a 4.5 average; caught 287 passes for 3,535 yards, a 12.3 average, and 20 touchdowns; returned 85 punts for 875 yards, a 10.3 average, and 1 touchdown; and ran back 121 kickoffs for 3,025 yards, a 25.0 average, and 1 touchdown, and ran a recovered fumble back for a td: 69 total touchdowns, for 414 points. 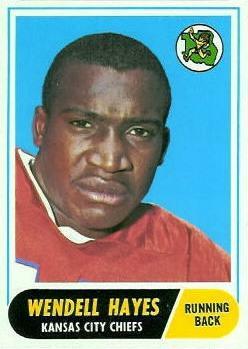 Haynes accumulated 12,065 combined yards, the American Football League record, and 68 combined touchdowns. Haynes had three games in which he gained 100 or more yards on 14 or fewer carries. He sponsors "Heroes of Football" a program that re-connects pro football players with communities and charities. Abner Haynes is a 2007 inductee to the Texas Sports Hall of Fame. 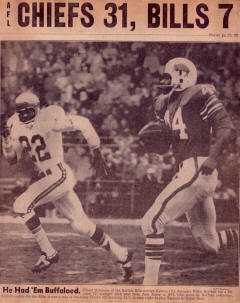 The photo below is from the 30 September 1962 game between the Buffalo Bills and the Dallas Texans at the Cotton Bowl. Haynes ran for 164 yards on just 16 attempts, with two touchdown runs, one of 71 yards and one of 13 yards, in the Texans' 40 - 20 victory. Bills number 82 is DE Mack Yoho. Attempting the tackle (number obscured) is number 56, LB Archie Matsos. 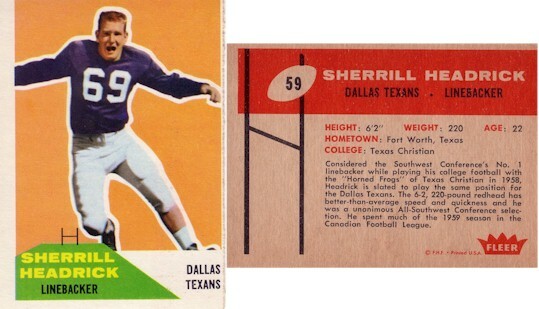 An original Dallas Texan out of Texas Christian University, Sherrill Headrick was considered the Texans' and the early Chiefs' best linebacker, a hard-nosed, all-giving player. He left TCU after three seasons and played one season at offensive guard, center and linebacker in the Canadian Football League (1959) before joining the Texans for the initial AFL season, signing as a free agent. His teammates called him "Psycho" for his rambunctious nature, a reputation he fueled by banging his head against his locker and working himself up to the point of nausea before games. The nickname also befit his style of play: in his first year with the Texans, Headrick set the standard for playing hurt, after fracturing a vertebrae in his neck in a collision in warm-ups before a game with the Houston Oilers. Despite feeling pain in his neck, he played the entire game. He learned of the fracture five days later, but went on to play the following week. Hank Stram said that Headrick, who refused to wear hip pads, had the highest pain threshold he'd ever seen in an athlete. Headrick payed with a broken neck, infected gums, and a fractured thumb. When an injury left the bone in his finger protrding from the skin, he popped the bones in place without missing a play. 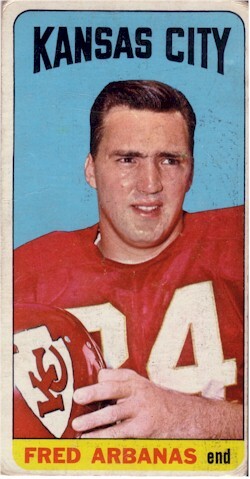 Headrick had fourteen interceptions during his eight-year Texans/Chiefs career, returning three for touchdowns. 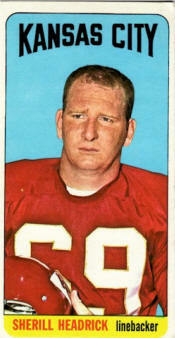 He played in the franchise's 1962 and 1966 AFL title game wins and in the first AFL-NFL World Championship Game. 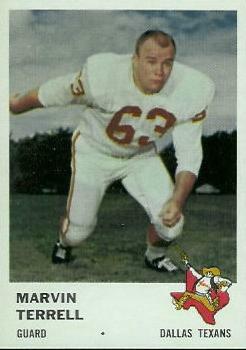 He was All-AFL in 1960, and an American Football League All-Star in 1961, 1962, 1965 and 1966. 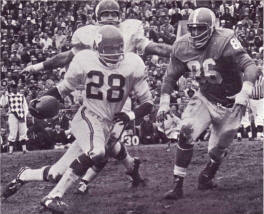 Headrick was selected by the Cincinnati Bengals in the 1968 AFL expansion draft and played for them one season. 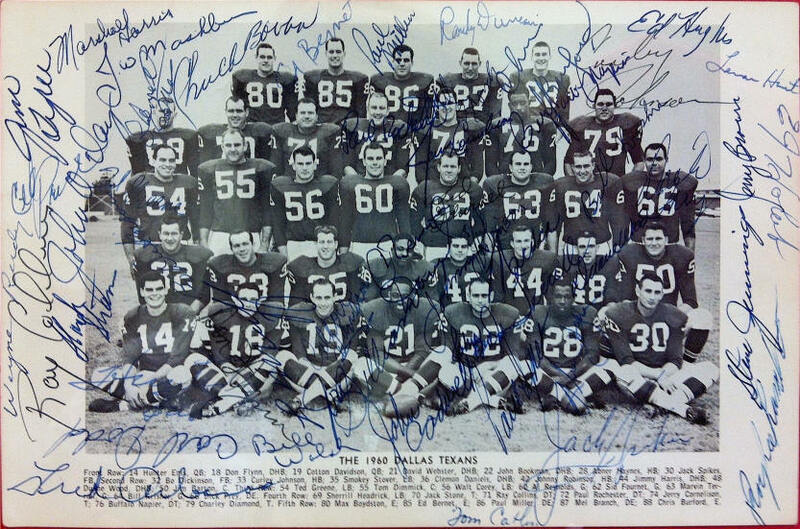 In 1961, the Dallas Texans drafted E. J. Holub of TEXAS TECH Universty. A member of the College Football Hall of Fame, Holub started for the Texans and the Chiefs as a linebacker, and as a center. Even after nine knee surgeries, Holub was a leader, a "holler guy". And he was a team player, enduring pain to lead his team. He would spend hours in the training room, watching blood and liquid drain from his knee, then go out to the field and perform as though he was physically "100 percent". He was an American Football League All-Star in 1961, '62, '64, '65 and '66 and was the only player to start two World Championship games at two different positions. 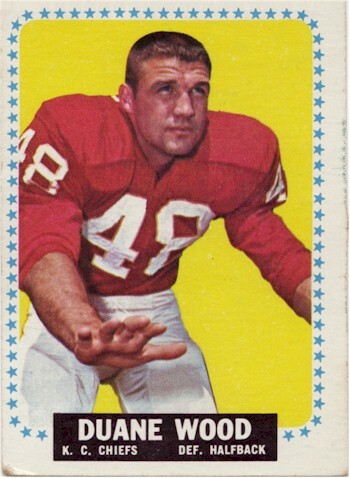 He started Super Bowl I at linebacker, then started Super Bowl IV at center and was a driving force in helping the Chiefs run past Minnesota 23-7. Bobby Hunt played college football at Auburn University. He was drafted by the Dallas Texans of the AFL in 1962 and went on to play in the AFL for the Texans, Kansas City Chiefs, and the Cincinnati Bengals between 1962 and 1969. He was first team All-AFL his rookie year with the Texans. Hunt had ten interceptions in 1966, tying teammate Johnny Robinson for the league lead. During his nine year career Hunt had forty-two interceptions, returning one for a touchdown. He was second team All-AFL in 1964 & 1966, and was selected to play in the AFL All-Star game in 1964. He was an AFL Champion with the Chiefs in 1962 and in 1967, when he played for them in the First AFL-NFL World Championship Game. After his playing career he was an assistant coach with the Buffalo Bills. Hunt is a member of the Alabama Sports Hall of Fame class of 2015. 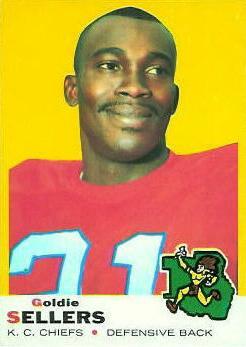 Frank Jackson played collegiately at SMU, and professionally with the American Football League's Dallas Texans, Kansas City Chiefs, and Miami Dolphins. As a halfback in 1961, he scored four TDs (two rushing, two receiving) for the Texans in a 49 - 21 victory over the Denver Broncos. 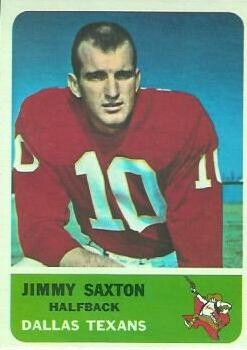 As a wide receiver, in 1964 he caught four touchdown passes from Len Dawson in a 49 - 6 Chiefs defeat of the San Diego Chargers. That tied the Pro Football record at the time. 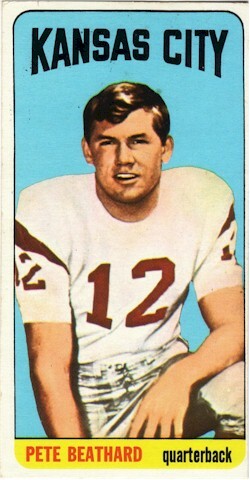 He was an American Football League All-Star in 1965. Jackson played on the Texans' 1962 American Football League Championship team, winning the longest pro football game ever played up to that time in the Championship game against the two-time defending American Football League Champion Houston Oilers. 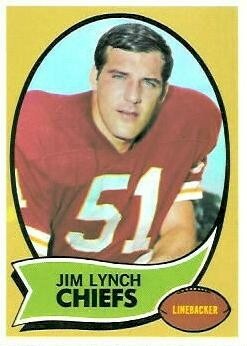 Jim Lynch was a heralded player from the 1966 National Collegiate Championship Notre Dame team and the recipient of that year's Maxwell Award, given to the best collegiate football player. With the Chiefs, though he was often overshadowed by his fellow linebackers, Bobby Bell and Willie Lanier (both members of the AFL Hall of Fame), Lynch had an outstanding career in his own right. He was credited by his peers with being an intelligent and fearsome tackler and was selected to play in the AFL All-Star Game in 1968. He finished his career with 17 interceptions and 14 fumble recoveries and a touchdown. He teamed with Lanier and Bell to hold the Vikings to seven points in the Fourth AFL-NFL World Championsip Game. 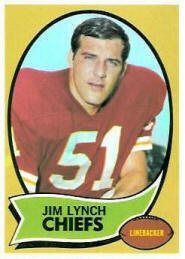 Lynch was selected to the Kansas City Chiefs' Hall of Fame in 1990, and to the College Football Hall of Fame in 1992. Lynch was also known for his progressive attitudes about race. When many of the bigoted old-line NFL teams held onto stereotypes about white players over black players, Lynch was an outspoken advocate for full integration of black players on the Chiefs. 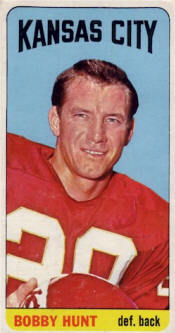 Lynch was interviewed during the 1969 season and expressed his pride in the fact that 8 of the 11 starters on the Chiefs Superbowl defense were black. 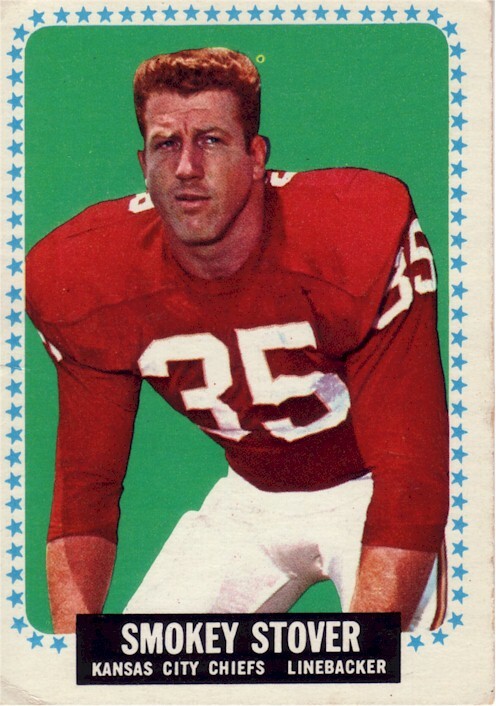 In 1961, in the fifth round, the Dallas Texans also drafted Jerry Mays of Southern Methodist University, where he had been a co-captain and an All-Southwest Conference defensive tackle. Mays was drafted by the Vikings, but chose to play in the AFL, near his home. He was a force at end on the Chiefs' vaunted defensive line, after starting his professional career playing defensive tackle. 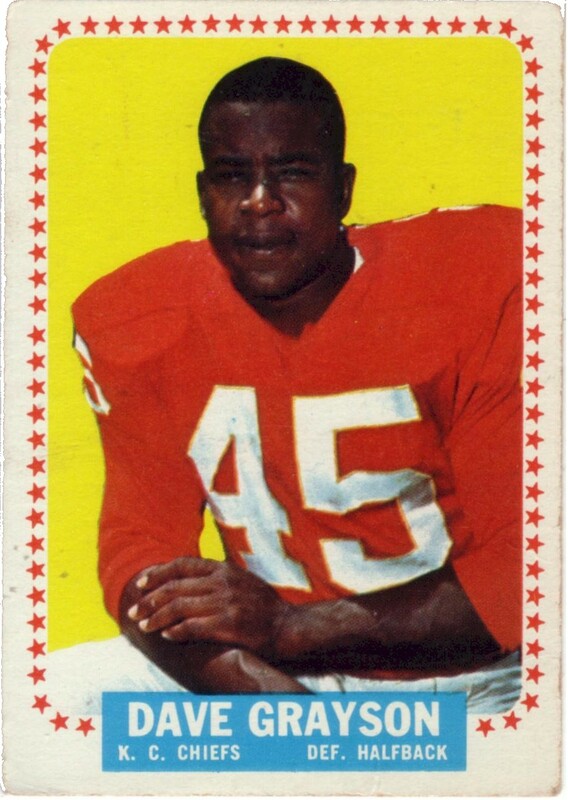 A six-time AFL All-Star, Jerry Mays was selected to the All-Star team at two different positions: at defensive tackle in 1962 and 1964, and at defensive end in 1965 through 1968. An emotional, durable competitor wth speed, agility and strong "second effort", Mays played in 126 straight games for the AFL Texans and Chiefs, and once recovered and returned a Jets' fumble 58 yards for a touchdown. He was not only an AFL player but an AFL fan, who empathized with Titans players when their paychecks were late and celebrated with Broncos players when they burned their infamous vertically striped socks. 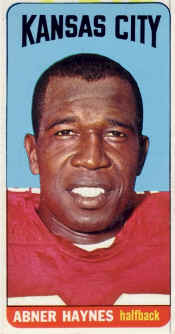 Mays is a member of the American Football League All-Time Team. 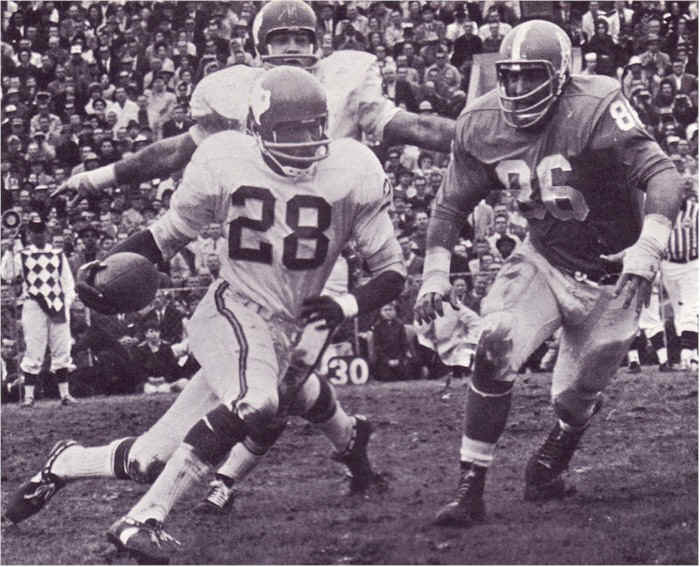 Halfback Curtis McClinton was a future choice by the New York Titans in the 14th round of the 1961 AFL draft, from the University of Kansas, where he is in the school�s Athletic Hall of Fame. His rights were traded to the Dallas Texans, where McClinton became one of the early stars of the American Football League. He was named the AFL Rookie of the Year in 1962, when he had 604 Yards on 111 carries for a 5.4 yards per carry average, and caught 29 passes for 333 yards. He finished the season off with his selection as the Outstanding Player of the 1962 AFL All-Star game. In addition to 1962, he was also an AFL All-Star in 1966 and 1967. Left off the AFL All-Star squad in 1965 in favor of the Chargers� Paul Lowe, McClinton still accumulated 1,251 total yards from scrimmage on 175 carries and 37 receptions for 6 tds rushing and 3 receiving. He had the size to run inside and the speed to run outside, and was excellent in pass protection. McClinton played on three American Football League Championship teams and in two AFL-NFL World Championship games. In the first, he was the first AFL player to score a TD. 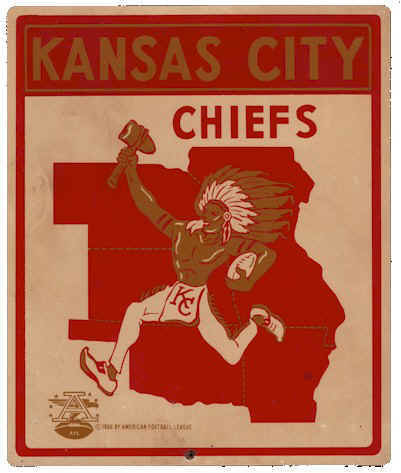 And in the last World Championship game, this early AFL star saw his Chiefs beat the Vikings 23-7. He is a member of the Chiefs Hall of Fame. Johnny Robinson was a master thief for the Kansas City Chiefs. 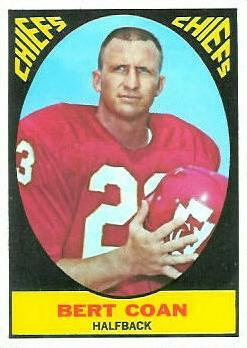 The Louisiana State University product led the Chiefs in interceptions with 10 in 1966, and 57 for his career, a team record. In Super Bowl IV, the underdog Chiefs defeated "one of the [so-called] greatest teams in the history of the NFL", the Vikings, 23-7. Late in the first half, Robinson recovered a Minnesota fumble and helped seal the Viking's fate. 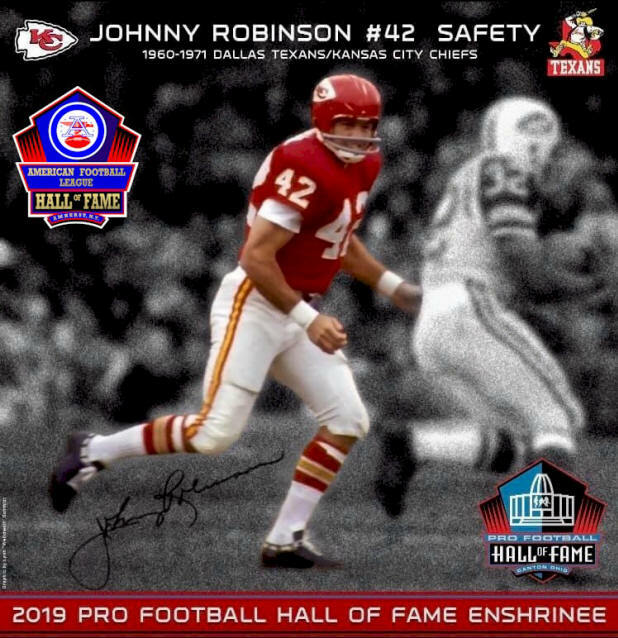 With Chiefs rushing to congratulate him, lying on the turf, Robinson held one finger high to signify that the Chiefs were the best team in professional football. Robinson also had an interception off Joe Kapp in the fourth quarter. Robinson was a six-time All-American Football League selection who played that Super Bowl game with three broken ribs. 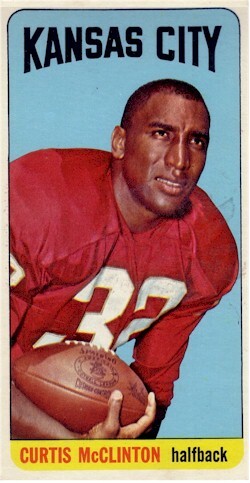 Five times the interception leader on the Chiefs, Robinson redefined the role of the safety in professional football. Opposing quarterbacks soon learned to keep the ball away from him. 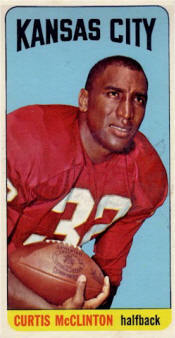 In 1968, Pro Football Weekly selected him to its combined all-pro team, and Robinson is a member of the All-time All-AFL Team. Robinson was one of only twenty players who were in the American Football League for its entire ten-year existence. After retiring, he founded and operates Johnny Robinson's Boys Home in Monroe, Louisiana. 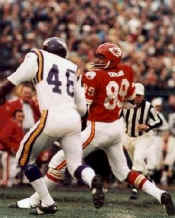 Otis Taylor, drafted and signed by the Chiefs in 1965 two years before the "common draft", was another example of the American Football League's expertise in selecting future stars from small, predominantly black schools, in this case, Prairie View A&M University. 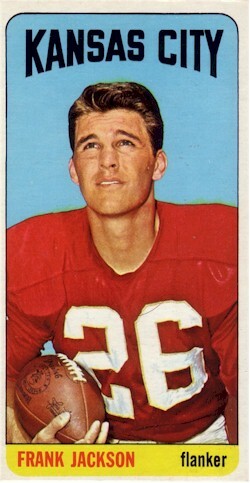 He caught five td passes in his rookie year, and in his second year, 1966, led the AFL with a 22.4 yds/catch average. 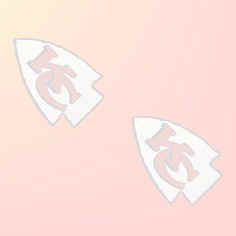 Taylor owns the Chiefs' career records for receiving yards (7,306), receiving touchdowns (57) and 100-yard games (20), and was an All-Star three times. Taylor stood 6-foot-3 and weighed 215 pounds. Along with his sure hands, he was a devastating upfield blocker, springing backs like Mike Garrett and Robert Holmes for many long gainers. 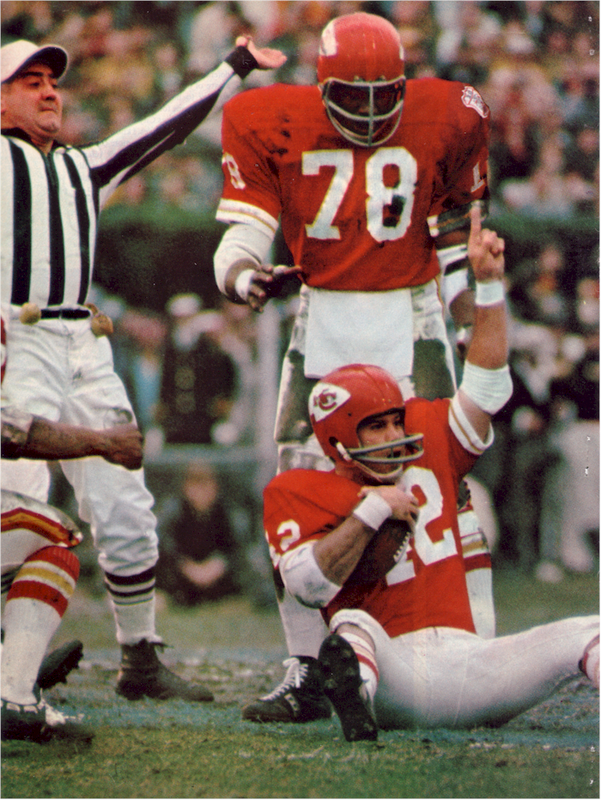 Taylor and Holmes teamed up for the longest reception in Chiefs history in 1969 when he caught a pass for 79 yards, then lateraled to Holmes, who carried it another 14 yards for a touchdown. Taylor was a rugged receiver with sure hands and the uncanny instinct to catch anything thrown his direction. He is the team's second leading all-time receiver with 410 receptions. 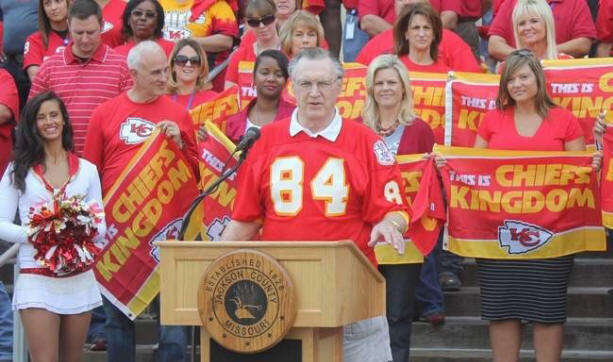 "Otis made my job easy," former Chiefs quarterback Len Dawson said. "If you got the pass to Otis, you knew he'd catch it." In the fourth World Championship Game, Taylor caught a short pass in the flat, turned upfield and stiff-armed his way to a 46-yard touchdown in the Chiefs 23-7 crushing of Minnesota. Under Woody Hayes, Jim Tyrer was an All-American at OHIO STATE. Signing with the Dallas Texans in 1961, he set the standard for his position. 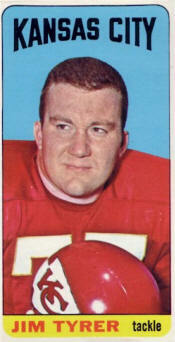 The best offensive tackle of his time, Jim Tyrer anchored the Texans/Chiefs line for 13 seasons. He was an American Football League All-Star seven straight years, from 1962 through 1969, and All-AFL five times. His blocks were crushing, and his consistent, outstanding play landed him a spot on the American Football League All-Time Team. He had an uncanny ability to open a hole for Chiefs running backs, which helped the team crush the Vikings in Super Bowl IV. The 6-foot-6, 295 pound giant would single-handedly take on two of Minnesota's vaunted defensive linemen, blow them away and lead the charge as Mike Garrett swept through the hole. Tyrer was named AFL Offensive Lineman of the Year in 1969 and played in 180 consecutive games for the franchise. It is a real example of the lack of research being done by Pro Football Hall of Fame selectors, that Tyrer was not admitted years ago. 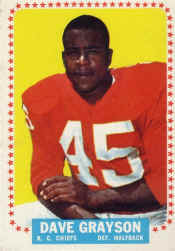 Jerrel Wilson was a center at the University of Southern Mississippi, and played running back early in his pro career, after being drafted by Kansas City in 1963. But he became an All-AFL punter for the Chiefs. He played more seasons than any player in team history. 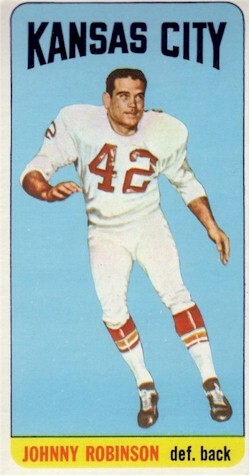 Wilson's booming punts earned him the media nickname "Thunderfoot", because he frequently got the Chiefs out of the shadow of their own goal posts. To friends, he was "Duck", a lover of the outdoors. Wilson had four punts of 70 or more yards in his career. He played for Kansas City for seven years in the American Football League, and 15 years altogether, a total of 203 games and 1,018 punts for the Chiefs. Wilson had a career average of 43.0 yards per kick and was at his best during big games. His average of 46.5 yards on 11 punts in two World Championship games is a record. He was selected as a member of the American Football League All-Time Team. 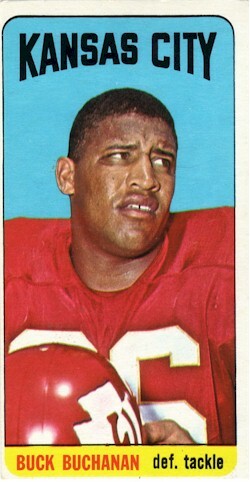 Wilson is a 1988 inductee of the Chiefs' Hall of Fame. The epitome of the American Football League's enlightened policies towards recruiting black athletes was Lloyd C. A. "Judge" Wells, a Texas Southern University graduate who, while he was a sports photographer, accomplished the desegregation of fan seating at amateur and professional events in Houston. 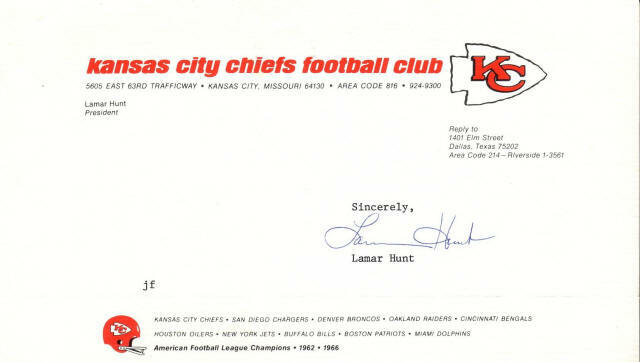 As a part-time scout for Kansas City, he convinced Grambling defensive tackle Buck Buchanan to sign with the Chiefs. He also recruited defensive backs Jim Kearney and Emmit Thomas, and linebacker Willie Lanier. After becoming pro football's first black full-time scout, in a famous "babysitting" incident in 1965, he managed to get Hall of Fame receiver Otis Taylor (Prairie View A&M) away from the other league's Dallas team. Wells' success was a catalyst for the old league to try to get up to speed in signing talented black players from small colleges, as the AFL had done from its inception. No less than eight of Wells' recruits made All-AFL during their pro careers. He had a major hand in staffing the Chiefs to enable them to win the Fourth World Championship Game. The only coach the Texans and Chiefs ever had, Hank Stram's teams won three American Football League titles, more than any other coach in the league's history. He also coached for the most victories (87), most post-season appearances (6) and the best post-season record (5-1). Stram was an innovator, a shrewd judge of talent, and an excellent teacher. He helped develop Hall of Famers Len Dawson, Johnny Robinson, Willie Lanier, Ed Budde and many others. In the Fourth AFL-NFL World Championship Game, his ingenious innovations, the "moving pocket" and the "triple-stack defense", utterly dominated the Vikings on both sides of the ball. In that championship game, Stram became the first professional football coach to wear a microphone. Stram's recorded comments from that game have become classics: "Let's matriculate the ball down the field, boys. ", and his assessment of the Vikings' ineffectual play: "You can't do that in OUR league!" The man who coached the team Stram beat in Super Bowl IV was elected to the "pro football" hall of fame nine years before Stram was admitted. Like those of other AFL pioneers, Stram's contributions to the game helped change the face of Professional Football. He was a ten-year head coach in the American Football League. CLICK HERE for a story on one of 'THE GREATEST COACHES PROFESSIONAL FOOTBALL HISTORY'. 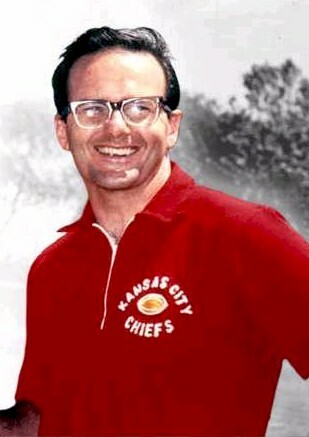 Lamar Hunt had a dream . . . to bring professional football to Texas and to American markets that had a yearning for the game in places other than the traditional Northeast. In fulfilling that dream, Hunt gave life to the league that was the genesis of modern professional football: the American Football League. 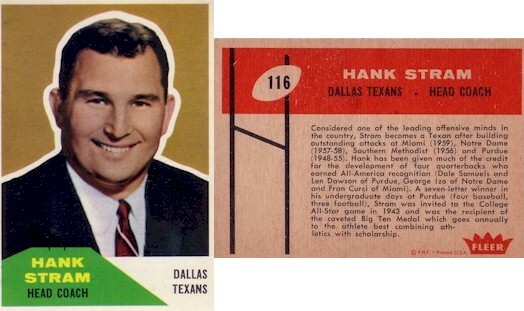 As his coach for the entire ten-year history of the AFL, he chose Hall-of-Famer-to-be Hank Stram. Hunt encouraged, entreated, wheedled, and cajoled seven other forward-thinking men to form a league that would forever leave its mark on American sport. The excellence of his team forced others in the league to compete to meet his high standards. Hunt and his AFL associates signed some of the best players ever to play the game, and brought new ideas, excitement, and color to AFL cities while other "pro football" towns watched "three yards and a cloud of dust". 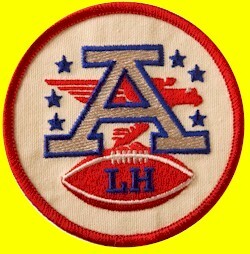 When his team capped off the league's existence with a crushing victory over a hugely favored opponent, it was Hunt who approved the 10-year AFL patch they wore, commemorating the ten years of excellence of the American Football League. For his foresight and perseverance, and for giving them ten years of pure football pleasure, American Football League fans everywhere say "Thank you!" 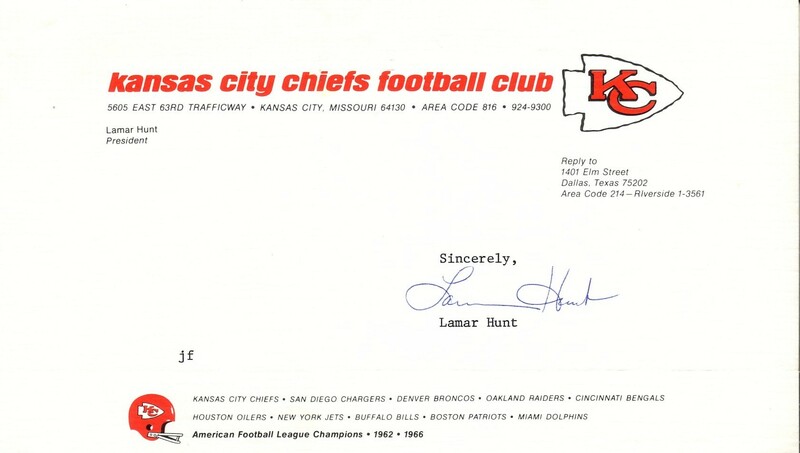 to Lamar Hunt.